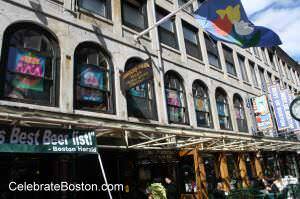 Since 1874, Durgin-Park has operated for nearly its entire history in the North Market Building at Faneuil Hall Marketplace. The cuisine is American, with the restaurant having a very good reputation. It is a consummate place to go on a date, with a long-standing reputation of serving fine foods, and the wait-staff being a little edgy. The restaurant has been around for more than 130 years, but what has remained constant over the years is a tradition of serving highly fresh Yankee cuisine that is native to Boston. Whether it's their famous dish, the Prime Rib Steak, or classic New England comfort food, a family meal at the main dining room or a round of drinks at the Hideout Bar at Durgin Park surely offers a whole lot to experience. Let's take a look at highlights from this restaurant's menu. Their signature Prime Rib Steak is, at the time of this writing, a whopping 42 ounces of caveman or woman meaty goodness. The famous Boston baked beans is also extremely popular, having been described as a gift of pure ecstasy by a previous customer. Other old-school, traditional foods includes lobster, clam chowder, seafood, BBQ, pork chops, lamb, a variety of steaks, and many more—all prepared with traditional local recipes and using fresh ingredients. The flavor of the dishes exudes the local culture which is deeply embedded into Boston. Customer reviews are mixed. There are those who attest to having the best meal of their lives, while others did not enjoy their food. Many customers specifically recommended the Boston baked beans and Pot Roast, which were both cooked perfectly, with the latter crumbling under your fork with tenderness. The ratings on the negative side were dishes such as potato, vegetable, and pasta, which were described as bland or without spices. Some exceptions did occur with describing the Pot Roast, but overall from the various reviews of the same dishes, the kitchen was very consistent and the ratings favorable. All in all, most were unanimous that the food was very good. About customer service, there are also mixed reviews. There are times when the promptness of the food exceeded expectations, like being served after only ten minutes or so, and there are other times when customers have commented about a lengthy amount of time for food to arrive. With regards to the wait-staff, there was a time in history when this restaurant, under different ownership, was known for its adoringly short-tempered staff. This has changed and they have become milder, but they still have that edge when they converse with you. Some say that it is intentional, in trying to keep with the tradition, but balancing it with providing good customer service, which makes it a unique atmosphere.